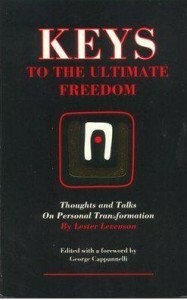 I read some reviews of Keys to the Ultimate Freedom – Thoughts and Talks on Personal Transformation by Lester Levenson and seldom have I found such positive appraisals. For some people, this book has been the single most important one in their lives. Lester Levenson developed the Sedona Method, his own method of achieving enlightenment, which he taught for years. This book is a combination of questions and answers from these sessions and talks on several topics. Lester Levenson developed the Sedona Method, his own method of achieving enlightenment, which he taught for years. Interesting that my ability to never accept what I think or believe I know today had led me to seeing that I am nonlimit and then as I did a web search looking for confirmation I stumbled on to this Holybooks site and then to the final chapter of this book which deals just with that. But of course so many teachers are pointing to just that but we have to keep opening the door with our minds until we fully experience and know in the absolute real now way that it is so. Questions of who or what I am cease. Objective worldly value or good has to by nature be limited and can not last. Not to say I won’t make the mistake of believing limited value is good again and start to suffer again but the more I see this the more I see it is self deception that I think the world which is made of objects that are empty of self nature and are by themselves neutral can cause deception and suffering. I could have worded that a little better but rather than re write it I will stand with knowing there is no objective good. Only “the” non limited subject is Real good. Even the negative self that feels or thinks it knows the world is objectively bad is subjectively confirming a subjective value of thinking/believing it is right not a real objective reality and is free to do so. God or Good is unafraid to be open to the possibility of experiencing temporary passing suffering. Thus it is good to be unlimitedly free to be able to suffer until we see what is temporary and what is beyond time. Even every thing of this world is unlimited in the sense that no thing can only be what it is without passing or able to pass. But passing does not apply to non limit which is experienced as timeless.